With so much planning going into a wedding, from the invitations to the catering to the limo that whisks you away to your honey moon, it’s easy to forget the importance of your wedding favor. Yet, like your photographs, these are a lasting memory from your special day meant to thank your guests for being a part of it. Rather than bric-a-brac that will just gather dust make your favors make a statement by filling up silk luxury favor bags or invitation boxes with items they will use. 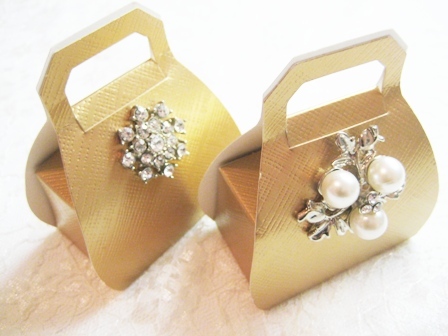 Why Silk Wedding Luxury Favor Bags or Boxes? When you use a customized silk wedding favor bag or box, you are giving a gift that ensures your wedding day will always be remembered. Once home, these turn into beautiful containers that can house anything from potpourri for the inside of drawers to bath salts stored next to the tub. Luxurious boxes look beautiful atop a nightstand or dresser and can house anything from your spare change to cufflinks and other jewelry. Every time your friend or family grabs for the luxury favor bag or box, they are instantly reminded of the couple who gave it to them. The party favor inside of the bag does not need to be lasting, that’s what the customized carrier is for. Instead it should be filled with something that makes a statement about who you are as a couple, or a reflection of your journey together. You could even create different bags for different groups of guests, filling them with goodies that reflect the role they have played in your relationship. For Women Guests – Fill the bag with a heart shaped essential oil diffuser necklace and array of different scented pads to go inside. Make sure to include the same scent as the flowers you used for your wedding décor and bouquets. For the Men – You could place bottle opener key chains inside of the bags if your friends are the party type, or golf tees and a personalized ball for the sporty guy. Buy these in the same colors as the wedding theme as a further remembrance of the day. For Kids – The little guests at your wedding should not be overlooked. Of course they would love a bag filled with candy, but you could also be creative and fill the bags with stickers, a set of jacks or personalized yo-yos. The time of year for your wedding could also dictate what goes inside of your party favor bags. If you are getting married in the late fall or early winter, holiday ornaments can be customized to fit inside of the bags. For spring weddings, fill them with seeds that can then be planted to start a herbal or flower garden. Using luxury wedding favor bags as your base opens up an endless number of opportunities to please your guests, make them laugh and give them something of value to be cherished forever. When you add those small touches in your wedding plans, your guests know that their inclusion in your wedding day was genuinely appreciated.